(Newser) – Fifteen buffaloes that escaped from a farm in New York state were shot and killed today after they dashed past a group of police, crossed a major highway, and ended up near some schools, authorities said. "The last thing we wanted to do was put these animals down," says Albany County Sheriff Craig Apple. "But it wasn't a safe scene." Three men hired by the farm opened fire on the animals this afternoon in woods in the town of Coeymans, about 10 miles south of the capital. Bethlehem police Lt. Thomas Heffernan said the decision was made after experts agreed tranquilizers would not be effective and no portable corrals or trailers could hold the animals. Na, its NY psychological game. 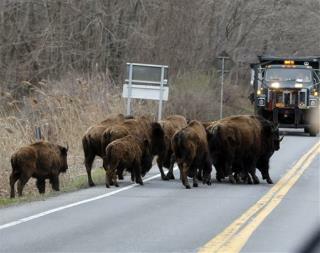 Roaming buffalo, that broke free and are looking for freedom, shot down for the good of the masses. Kill! Kill! Kill! They couldn't possibly have rounded them up into a truck and taken them back where they belong, could they? It's just easier to kill something!